Bandai Namco has today outlined its DLC plans for Tekken 7 following the beat ’em up’s scheduled launch this summer, with the first batch due to drop shortly after the game’s release. That will be followed by the arrival of two additional guest characters, the first slated for late 2017 and the second in spring 2018. 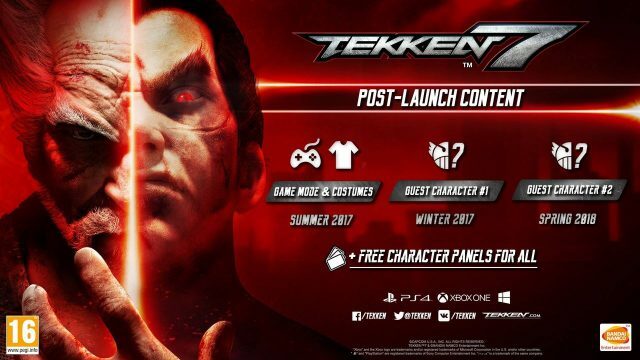 But first things first: Tekken 7‘s initial piece of DLC will include a brand new game mode, as well as over 50 brand new costumes for existing characters, so if you’re not keen on your favorite fighter’s standard threads, this will no doubt help to remedy that. As for the guest characters, Namco has yet to reveal who or what they are but does confirm that both combatants will be from other franchises. Given that Akuma from Capcom’s Street Fighter series has already been confirmed for the title, I imagine that, whoever these mystery characters are, they won’t be from that series. Sadly, given that this latest iteration of Tekken is headed to both PlayStation 4 and Xbox One, it’s unlikely we’ll be seeing any characters directly owned by Microsoft or Sony making the cut but never say never. All DLC will be available to purchase separately or as part of Tekken 7‘s Season Pass, with 35 additional metallic costumes included with the latter as an added bonus. Tekken 7 is out June 2 for PlayStation 4, Xbox One and PC, following a handful of limited releases in Japanese arcades. For a full rundown of the most recent character reveals, including those of Kuma and Panda, see here.